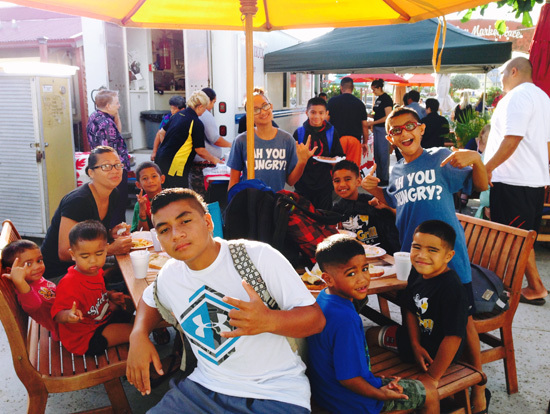 Starting with a free breakfast for those Polynesian Cultural Center ohana or family members who were working the morning of August 10, one of Laie’s premier Samoan-Hawaiian families opened Tita’s Grill in the Hukilau Markeplace roulotte or food truck court. Laie football and sports legend Junior Ah You, his beautiful wife Almira, and their extended family view their newest location at the PCC as an extension not only of their restaurant across from nearby Kahuku High, where Junior started his illustrious sports career, but also of their “home and hearts,” according to their oldest son, Kingsley Ah You. Acting as family spokesman, Kingsley Ah You — a Behavior Health Specialist at Kahuku High when he’s not helping out at either the Kahuku or PCC grill operations, said instead of retiring his parents leased the restaurant and bakery facility across Kamehameha Highway from Kahuku High about five years ago and started up Tita’s Grill. Tita is a Hawaiian-English word that on its surface can mean “sister” or “woman”; in this case, the grill is affectionately named after Almira, the matriarch of the Ah You clan. 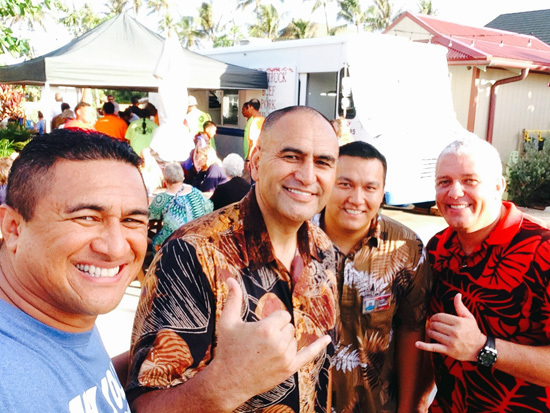 Junior and Almira had previously been catering for many years and were already well known around Laie for their ability to feed large numbers of people at various community and church functions. That includes mom and dad; cousins Mele Semo, and Chardene Semo and her mother Fau Semo; sister-in-law Uheina Ah You — “my brother, Quin’s wife”; and also Aunty Rowena Pili Reid and her late husband, Ernie Reid, who have been very supportive of Tita’s Grill. Kingsley’s sister, Tamara, and her husband, Leroy Suamataia, also previously ran a Tita’s Grill at a golf resort in Utah, but they have since returned to Laie. 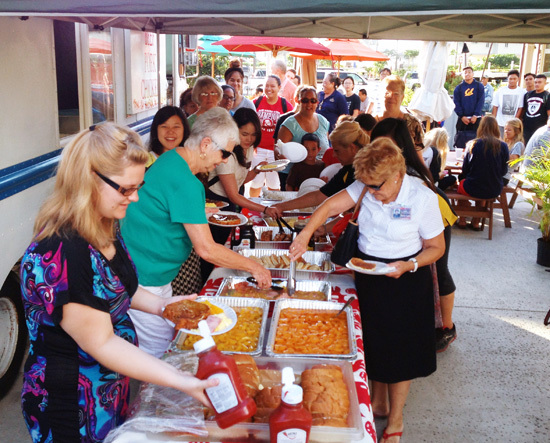 “Here at the Marketplace, our garlic chicken dish and mango fish have been hot sellers. Shrimp and combo plates are also very popular. Of course, our cocoa-rice and Polynesian bread also sell all day long, and not just to local people. I was speaking to a PCC guest the other day from Utah who said she loved the cocoa-rice and bread.” Fans of the Ah You’s Polynesian bread describe it as more robust, chewier — and it’s especially ono (delicious) when toasted. Junior Ah You grew into a superlative athlete at Kahuku High. 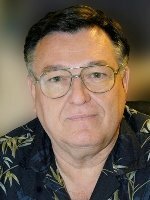 He earned a full-ride football scholarship at Arizona State University, graduating in 1972. During those years he and Almira would also put on Polynesian shows and luaus throughout the Intermountain West. “He was drafted by the New England Patriots, but decided to go to Montreal where he could continue to play primarily as a defensive end for the Alouettes in the Canadian Football League for nine years. He also played two years after that in the USFL, and retired in 1984,” Kingsley continued, noting that Ah You’s #77 is just one of ten numbers retired by the Alouettes. He was drafted into CFL Hall of Fame in 1997, and is also a member of the Arizona State and Hawaii Sports Halls of Fame. Tita’s Grill is open Monday-Saturday at the Hukilau Marketplace for breakfast from 7-9 a.m., and otherwise from 10 a.m. to 9 p.m. The Kahuku restaurant is open Monday-Friday from 7 a.m. to 7 p.m., and Saturday from 7 a.m. to 4 p.m.